I've been playing with some graphics mods recently and discovered it was possible to use the latest ReShade framework with FPSC Classic. This is an important development as it opens the door to some new graphics features and performance optimizations which had made previous ENB series mods not viable. There is still a limitation for any effects which require depth buffer access e.g. DOF as this was only recently added in GameGuru but still gives plenty of nice options and settings to play with for Classic. 2. Extract then double click the installer and follow the instructions. You can change the target directory for built FPSC games. If you decide to use this and find any really good presets, please upload your MasterEffect.h file so we can share them. Wow ! Just wow Beautiful work Nomad. Downloading now. So your saying best to add after a game is "built" correct? I would recommend adding this to built games but there is no harm adding to the FPSC installation directory as you will probably want to use it during test games. Just remember to use the Scroll Lock key to enable / disable as you probably won't want it switched on for the map editor etc. The performance is actually pretty good for me as I've only enabled effects which are compatible with FPSC but it will be interesting to see how you and other people find it. Edit - I've updated the instructions to make the installation easier and included the license which should be included in any non-commercial projects. If you want to include the files as part of a commercial game you need permission from the author. Edit - If you are using this package with Black Ice Mod I recommend replacing the default post effect shaders with the ones attached to this post. This will make it so you only use ReShade bloom instead of combining with FPSC bloom for better performance. even before running the test. One question, when you said "You can even edit this file whilst the FPSC game executable is running"
to from a built game. LOL. I'm glad your having fun with it. You can recompile the effects whilst running a test game or a built game as long as you have the files in the root folder. What I meant is you can be testing or playing a game then use Alt+Tab to switch to the MasterEffect.h file (open with notepad) then make your changes and press Ctrl+S to save. 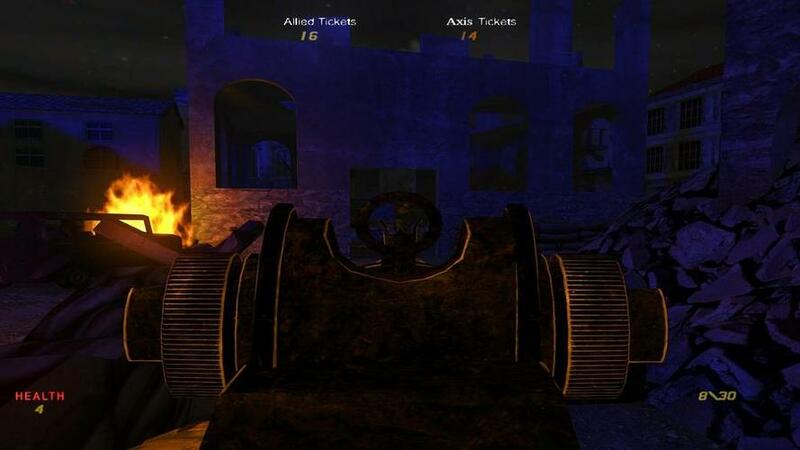 You will then see the ReShade text appear in the top left corner of the game telling you the recompile has completed successfully and the changes will be activated without having to quit out of the game and make the changes offline. Don't forget if you put together a really nice preset then please share your MasterEffect.h file! Edit - I've just added an installer package in the 1st post to make it even easier to install! You can change the target directory to a built FPSC game rather than copy / paste manually. Wow, a lot of power with that. It really perks up a level. Was curious, so I tried it on a GG stand alone also. Wow. Quote: "Was curious, so I tried it on a GG stand alone also"
Yep, also works in the editor mode. Makes a big difference. For FPSC classic one is able to run both this shader system and "post processing"
@Pirate Myke - Thanks and hope your having fun. @ncmako - Cool, please post any pics or videos you have as would be nice to see what is possible with this. Having great fun. I see in the installed part that there are conversions for segments and entity's. Can you explain what these will do, and if I should back up the media before trying this? Still having a great time with this system. Will definitely post some screen shots shortly. with the older post-process problems we had?) Trying to remember how to correct that. @Pirate Myke - There are no changes to segments / entities as part of the ReShade implementation. The ReShade features are all post effects which enhance the overall scene and all segment / entity modifications are part of Black Ice Mod. @ncmako - Looking forward to seeing the shots. Yeah the green screen is usually either because of a shader compile error or calling a texture incorrectly. FPSC uses hard coded textures for post shaders which is why you need to use the default names for custom shaders. I'm surprised you were able to trigger any of the ReShade effects from within FPSC and I'm doubtful it could be implemented that way without some assistance from the original author but it would be great if it worked. Just to let everyone know I've updated the installer to include a keycodes file as I got a request from a GG user to change the activation key from Scroll Lock. There are also some new commands in the ReShade file which allow you to show performance statistics whilst a game is running by changing '#if RFX_ShowStatistics == 1' to '#if RFX_ShowStatistics == 0'. You can also get a notification when switching ReShade on / off by using the '#if RFX_ShowToggleMessage == 0' command. I'm hoping to do some optimization work on this later on as there are features which are not appropriate for Classic and may be using additional frames somewhere. I gotta say, I applied this to my Combat 1944 game and played around with it for a while. It looks absolutely stunning!! I will hopefully get some screenshots up here when I get back home to my gaming computer. Anyhow, the only problem I noticed is that the effect screws up the loading screens. It looks as if some sort of bloom effect continually applies itself to the image on the loading screen and the screen gets really really bright. I'll run the installer version as opposed to the manual installation I did to ensure that I didn't copy something over wrong. But other than that - utterly fantastic! I played Day of Defeat Source later in the day and FPSC looks pretty visually similar to it, which isn't too bad considering the ages of those engines. Bravo sir! And I know this belongs in the Black Ice Mod thread, but I have to ask....any chance I can get my hands on that custom AI in the video from that thread? It looks sooo good and Gameguru still doesn't support allies. In either case, have a on me! @Susysyay - I've had a quick look into the loading page issue and this is a strange one as its not happening with GG. I'll try and find some more time for this but we now have a workaround. - ReShade effects now disabled by default so they don't interfere with the editor or loading screens and only activate in-game when using the Scroll Lock key or custom key assigned. - ReShade enabled / disabled notifications are now on by default as the effects are no longer switched on automatically when the executable loads. - Added a new file 'common.cfg' in the MasterEffect folder for controlling a number of parameters so global parameters in ReShade.fx work correctly now. - New flag '#define RFX_DepthBufferCalc 0' now included to ensure there are no depth buffer effects being used which should result in better performance. Apologies as you will need to download the installer again but I prefer to keep all the updates / fixes there rather than uploading attachments. Don't forget to backup your MasterEffect.h file before reinstalling! Please can you upload your MasterEffect.h file with the settings you've made for Combat 1944 as I would love to play this with your preset. Also looking forward to seeing any of the new screenshots. Look out for a PM from me in regards to the Bot AI in the next few days. Here are two screenshots from a Neuville in Combat 1944 with some light ReShade Effects thrown into it. I've got a little bit of bloom, lens flare, and extra color correction on top. There's so many options and parameters to tinker with! This is just a little experimentation. Oh, and the Anti-Aliasing is a godsend for FPSC, so thank you for that! Anyway, I'm going to keep playing around with this reshade function on some of my new projects and ideas. I am kind of finished with Combat 1944 and am thinking of follow-ups to it which could definitely take advantage of this reshading. I hope you enjoyed this two screen shots, I know they don't show off the reshade to its fullest extent, but the visual fidelity definitely took a giant leap with this mod. Those pics look great. I also try to use the effects in a minimal way and the Anti-Aliasing is a massive help as you say! You've done a great job with these games and I'm looking forward to seeing more. what could be done. Here I used the "colorhuefx" (sin city look) and desaturated all but blue & red. Added a bit of lens flare with "Gaussian Anamflare"
SMAA is "on" and finally a little "VIGNETTE" at the borders for an older feel. 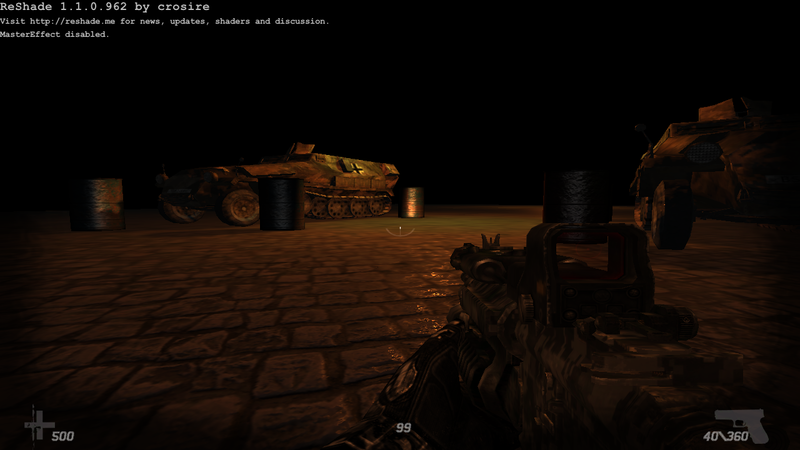 Almost forgot to mention, also running a post-process "Rain" shader effect. Now THAT looks cool! Reminds me of Blues and Bullets a bit! Is there a WIP thread of that game? I'd like to see more of it! Thanks Susysyay Also, how do you get your "iron sights" to look so crisp and clean? @Susysyay - Yeah sure, will get back to you ASAP. Those iron sights do look rather good upon closer inspection! Screen shots look sweet ncmako. Are you making a detective game? I love a good mystery game. Sorry not getting back sooner, busy working. Have mulled the idea of a detective story for some time. Wow!I'm so glad to see that there are still some people in to fps creator x9! And as always great job Nomad! Main shader consists functions like SSAO, HBAO and SSGI. I get that you just dont delete them after GameGuru project or you find some way to make it work in FpsCreator Classic? @MARSHMALLOW - Thanks and nice to see you around. @Kuper - FPSC Classic doesn't have any depth buffer access so depth based effects don't work unless being simulated. Remember to backup your MasterEffect.h settings before installing. Quote: "If you decide to use this and find any really good presets, please upload your MasterEffect.h file so we can share them." No one would like to share theirs? I just started to mess around with this. Thanks for the upload Nomad Soul. LOL yes nobody has shared their configurations so far but seems plenty of people are using it which is the main thing. If you haven't already tried Black Ice Mod, I have included ReShade in the latest update installer there also. Nomad, how put a depth of field or blur like modern games or game guru? If a can get some of dof will be great in my game. Sorry fot the bad english. I've actually removed the depth based code from ReShade as there is no depth buffer access in FPSC so what happens is you just get the same amount of DOF applied to everything. I tried all the various techniques and settings but wasn't possible to get something working well enough to include as a supported feature so opted for maximum performance instead. The good news is I will be adding a more advanced version based on ReShade v2 released this month which will have limited support for a simulated DOF effect. You will need to use a UI mask texture for this as all depth based effects also impact the UI unless you mask those areas. @themegapolice 96 - I will add some limited support for DOF and motion blur in the next release but these will be simulated effects due to no depth buffer access in FPSC. I like this stuff, but it does not really work for me. I installed "BlackIceMod" and "Physically Based Shading" when i use segments and entities with shaders, all is way to bright and does not really behave as expected. What i want is a pitch black enviroment with segments and characters reacting to static and dynamic lights like in the video sample above. The format to save DSS from within PS was part of my problems. It seemed only to work with "8.8.8.8 ARGB 32 bpp | unsigned". The alpha channel of the _N map has to be white and that of the _S map pitch black. Additionally i had to adjust the brightness of the RGB channel of the _S and the _D maps a little to get the above results. The character ist nearly black in black corners and lights up if it comes near light sources, just as i wanted it to be. Nice work Snake675 Is that last screen shot a post-process effect or a ReShader ? Thanks. Its taken from the post-procesing effects of nomad mod: "setposteffect=pain"
After building a standalone, ReShade was not included in the game folder so i installed it once again into that directory. It worked but i had to activate the ReShade effects by pressing ScrollLock. Is there a way to activate it initially or by script? You are right. The purpose for the installer is so you can install to the main FPSC directory for test games or to standalone games and install there. There is a slight inconvenience in copying your MasterEffect file across for custom configurations but a minor one. How to get the blue lights like the user ''ncmako'' ? I activate the effect in high settings, but nothing happens. #define USE_ANAMFLARE		1	//[0 or 1] Anamorphic Lensflare: adds some horizontal light flare, simulating the use of an anamorphic lens while recording. I have a problem now with this mod. I can see a blur or dof effect activated, but in the mastereffects all effects are disabled. in previous games with this mod I not pass this. Nvidia has a 3d screen and this causes the problem. @themegapolice 96 - Glad you managed to resolve the issue. /*==============================================================================*\ | ENABLE EFFECTS | \*==============================================================================*/ //LIGHTING #define USE_LENSDIRT	1	//[0 or 1] Lensdirt: Simulates a dirty camera lens. IMPORTANT: bloom threshold and amount have influence on the intensity of the dirt! #define USE_BLOOM 1	//[0 or 1] Bloom: Makes bright lights bleed their light into their surroundings. NOT the SweetFX way to do bloom but a more proper way. #define USE_LENZFLARE 1	//[0 or 1] Lenz Flare: Boris Vorontsov's Skyrim Lensflare with custom offsets, ported to MasterEffect. #define USE_LENSDIRT		1	//[0 or 1] Lensdirt: Simulates a dirty camera lens. IMPORTANT: bloom threshold and amount have influence on the intensity of the dirt! #define USE_BLOOM 		1	//[0 or 1] Bloom: Makes bright lights bleed their light into their surroundings. NOT the SweetFX way to do bloom but a more proper way. #define USE_LENZFLARE 		1	//[0 or 1] Lenz Flare: Boris Vorontsov's Skyrim Lensflare with custom offsets, ported to MasterEffect. When I activated ReShade my screen was filled with dots.